I first came across OSP with a posting of a new soap in Badger and Blade. It was getting lots of attention but seemed like only a few had it. After some time and many more appearances of the soap I started to get curious. 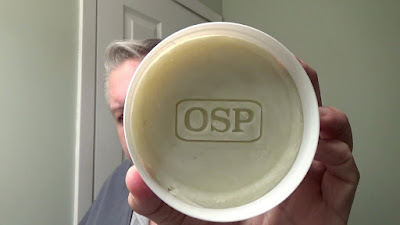 So on Nov 1, I contacted James the owner of The Obsessive Soap Perfectionist better known as OSP. I asked him if he sold samples and wanted to do a review on his soaps that I heard so much about. He wrote back that at this time he had no samples but he was willing to come to an arrangement but first he wanted to know about me and Wet The Face. I understood why, with so much attention about his soaps he just wanted to make sure I was actually running a Google+ community group so I supply him all the links to my Social Media outlets. I also wrote a little something about myself. Once he saw that I did indeed have everything that I said I did we came to an agreement on scents and shipping charges which are outrageous by the way. Then after 20 days they had arrived and now I’m finally able to write about them. Let me start off with a little about James. I asked for a little background about him and how he got into soap making. Here’s what he had to say. So I'm 28 and studied as a motorcycle design engineer before moving into manufacturing, and then general management. As you can tell, I have a passion for motorbikes, but when working as an engineer I was moving around England and couldn't take my bikes with me. I was looking around some local shops and stumbled upon an antique shop that had a job lot of straight razors. I thought they were cool, so I bought a few. Being a hands on person, collecting turned to using, restoring and honing. I got into soap making through not being satisfied with some of the offerings available in my country. I announced on the forum theshavingroom that I was going to do it as a hobby, and if anyone would like to sample my soap. After 5 or so rounds of samples, I was getting comments along the lines of "you should be selling these!" And so I took the plunge! The company name comes from a comment that one the members on there said that I "had a case of OSP - obsessive soap perfectionist." I couldn't use another name after that! 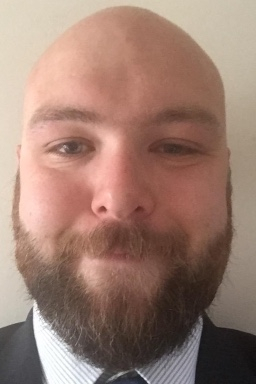 As for the beard in my photo, I do a lot of charity work and I’m growing one for that reason. James sent me two full tubs of his soaps Grapefruit/Menthol and Lavender plus a mystery package of a soap with a name written across the front. I’m not sure he wants me to talk about that one now so I’ll save that for another time. I selected Grapefruit/Menthol for my testing. The tub is made of smooth white plastic with a screw on lid and water proof label. The labels will tell you exactly what inside no cute names for theses soaps. I did have a slight issue holding the tub when loading my brush. It’s so smooth that it was slipping right out of my hands but I managed to quickly get it under control. The scent of this soap is just wonderful. I’m a big fan of citrus and this one is heading to the top of my list. I’m sorry to say I never noticed that the soap had menthol but what a pleasure it was when I started using it, just the right amount for an invigorating shave. Loading the brush was no problem for OSP, I wet my brush and rang it out right in the tub. It instantly produced a rich creamy lather that had great coverage. I do advise to keep adding small amounts of water and keep at it you will see the pay off in the end. When applying the lather, the citrus just exploded and the menthol kicked in as well. I had plenty of slickness and glide during the entire shave. My post shave feel was wonderful I could still smell the citrus after the shave and I had a great cooling menthol feel to my face. I just love a shave like that. James has a winner here. His hard work and dedication to the craft will most definitely payoff for him and all wet shavers. I’m expecting that a local artisan here will pick him up to stock his products so we can all enjoy them. All made with essential oils - I will never use fragrance oils in shaving soaps! Ingredients: Aqua, Sodium Tallowate, Potassium Tallowate, Sodium Stearate, Sodium Castorate, Potassium Stearate, Glycerin, Potassium Castorate, Sodium Cocoate, Potassium Cocoate, Sodium Avocadate, Lanolin, Butyrospermum Parkii (Shea Butter) Fruit, Potassium Avocadate, Kaolin, Parfum, Menthol.